2008-03-18 We have finally uploaded the program! We apologize for the delay. 2008-01-25 Due to multiple requests, the deadline for submissions is extended to February 4. 2008-01-14 We are sorry to announce that Jason Merchant and Dominique Sportiche will not be able to attend the conference. 2007-12-15 The submission of abstracts is open, see call for papers. We are grateful to our sponsors Avicomp Services and Ontos AG, IT-companies developping natural language processors and related NLP products and services for the Semantic Web. We proudly present the proceedings of the previous MSCL. This time we will also edit a proceedings volume, more details to follow. Ф. И. Дудчук, А. В. Подобряев, Н. В. Ивлиева (ред.).  Москва: Издательство Московского университета, 2007.
edited by Philip Dudchuk, Natalya Ivlieva, and Alexander Podobryaev. 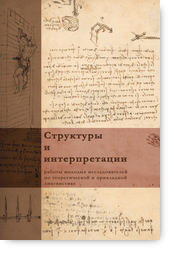 Moscow University Press, 2007. Syntactic Structures 2 to be held in RSUH on April 34. Formal Semantics in Moscow 4 to be held on April 56. MSCL-3 is held within the project of the Lomonosov International youth scientific forum.